As graphics designers, we’re computer jockeys for much of the day. Stuck behind a monitor for hours makes us wanna break out the tools and work with wood or metal. 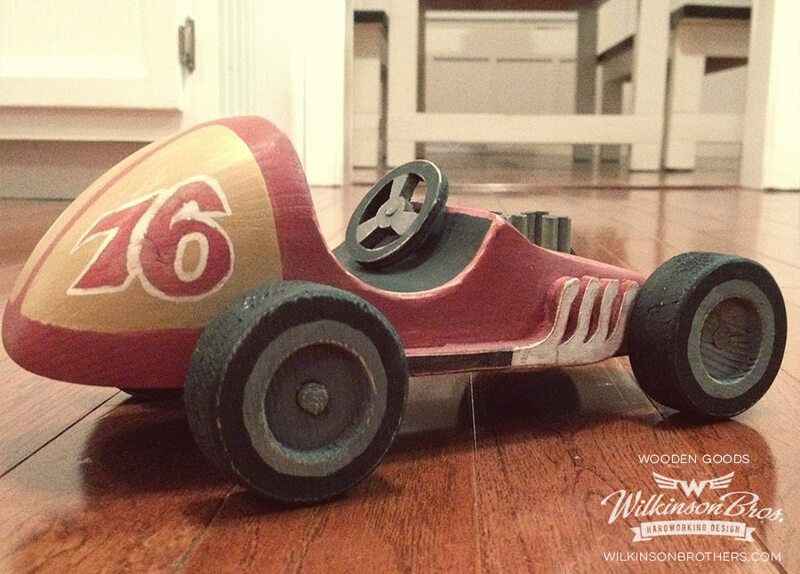 Give us a saw, wood, a welder and some paint and we’ll come up with something fun. Here’s a sampling of distressed, repurposed and handmade goods we’ve added to our creative repertoire. We like old things and bicycles. 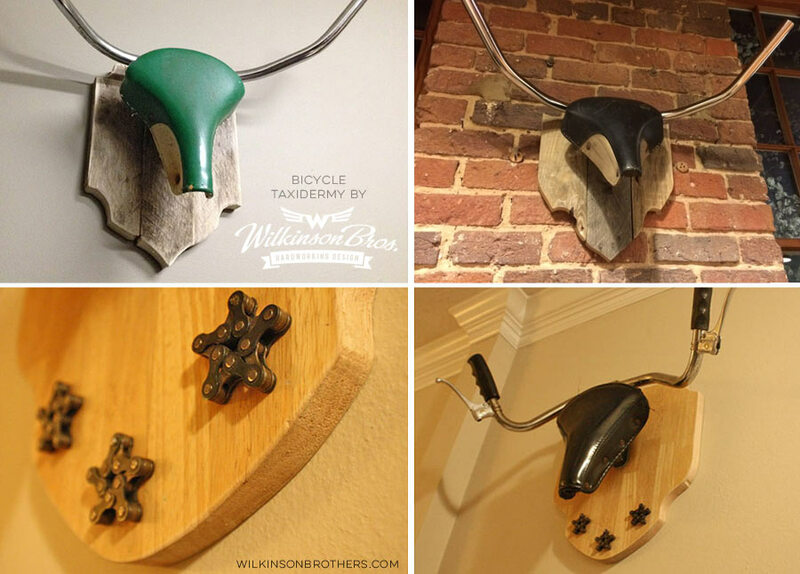 Combine them both and you’ve got our custom bicycle game trophies, or “bicycle taxidermy.” Using vintage bike seats and discarded sets of handlebars, we’ve created unique, repurposed decor. The plaques are made from pallet wood and reclaimed lumber with custom mounting brackets. 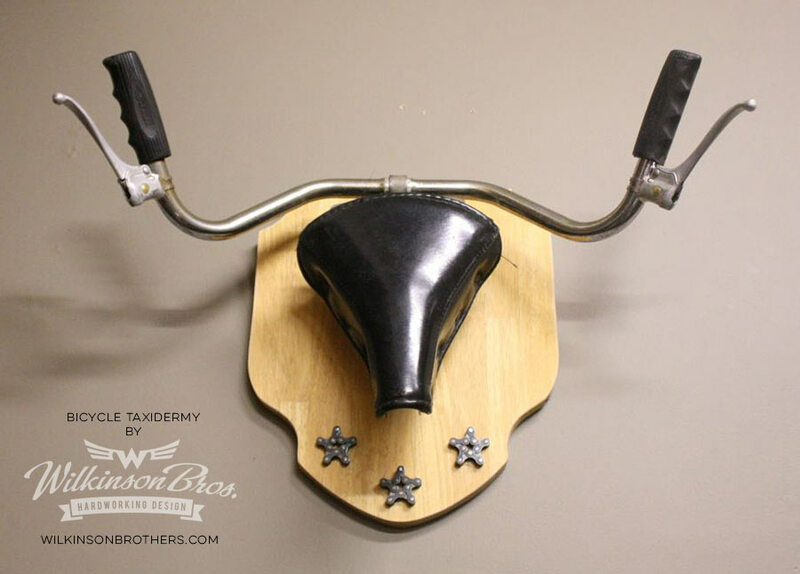 On the piece above, a solid oak plaque is adorned with stars made out of bicycle chain. Computer-generated graphics and illustration have been our bread and butter, but recently, Wilkinson Bros has been commissioned to create these one-of-a-kind goods. We love this kind of work; it’s dusty, noisy and may require band-aids, but it leads to fun results. 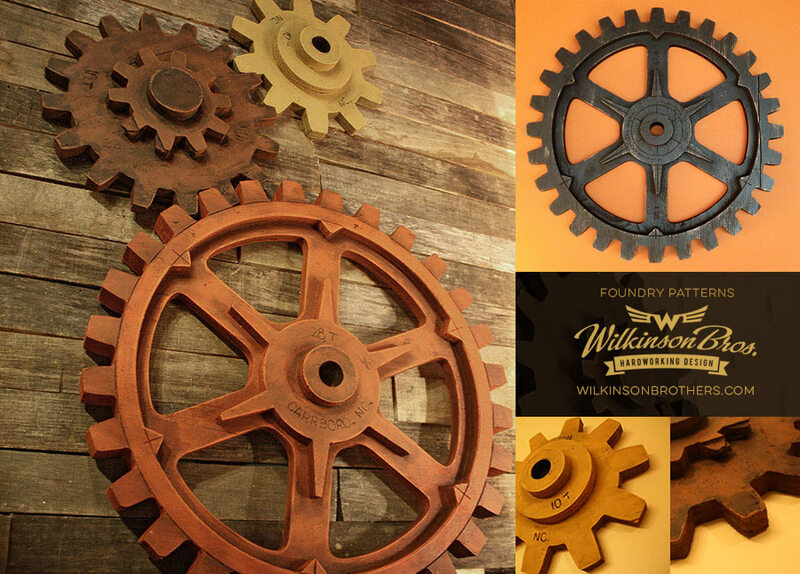 In the late 1800s and early 1900s, foundries would enlist a Pattern Maker to create wooden patterns of gears and other mechanical objects. 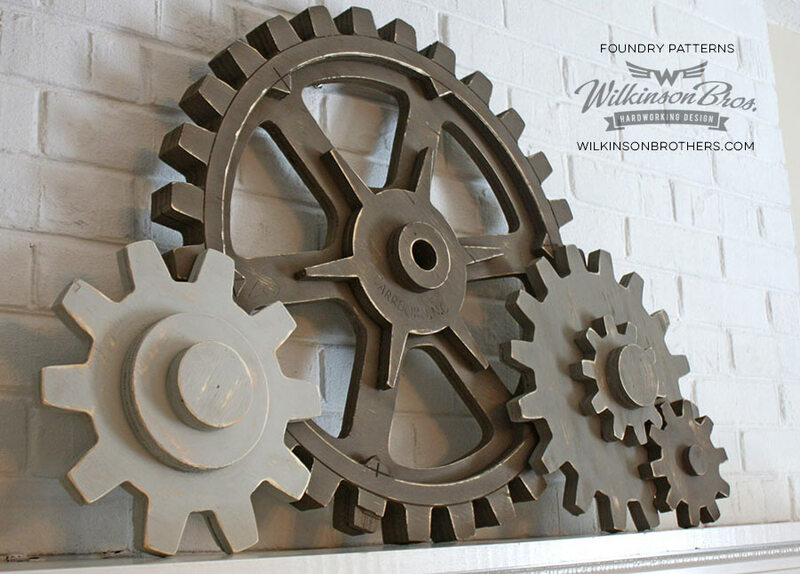 The patterns would then be placed in sand to create a mold (sand casting) where molten iron would be poured. 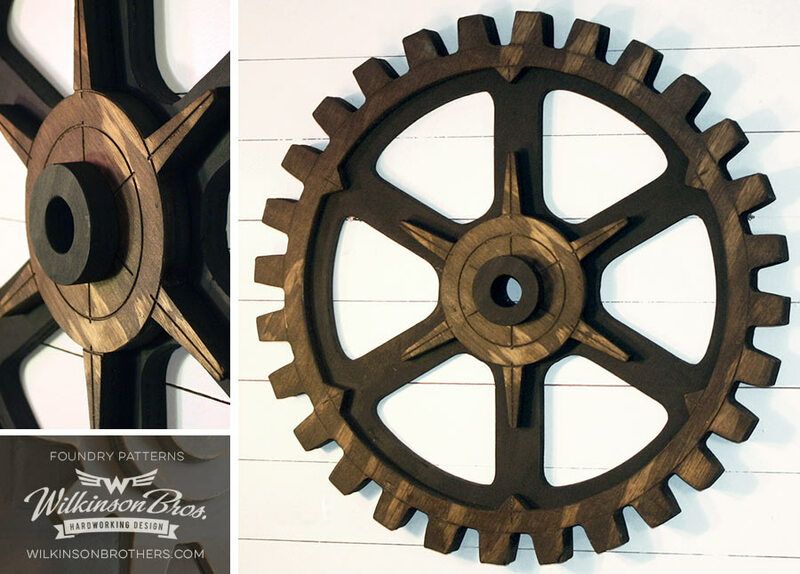 Our wooden gears are a careful reproduction with a hand-worn patina, an homage to an industrial art form. We dig making throwbacks to industrial days or putting a spin on lodge-like game trophies, but sometimes we’ll get the itch to make a toy. A good ol’ wooden toy that reminds us of folk art. The car below is modeled after a 60s dirt track racer built by Dan Tucker (Corey’s grandpa-in-law). 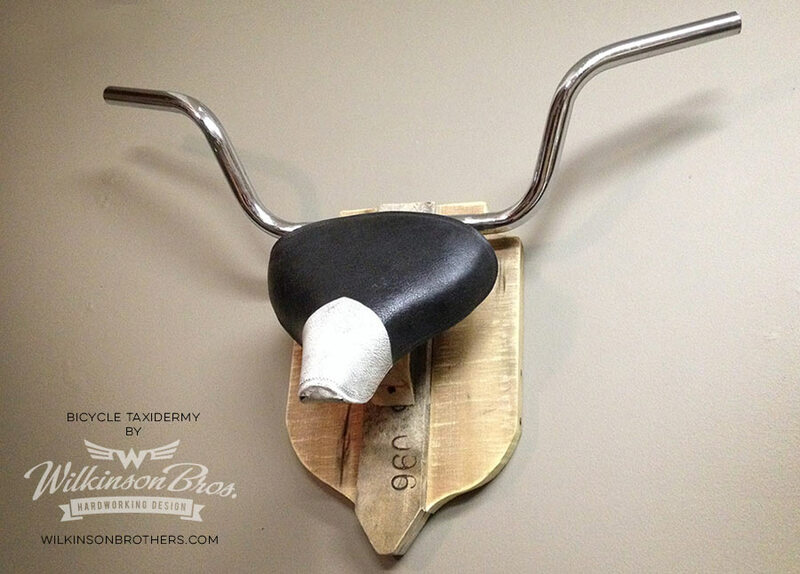 Making stuff with our hands keeps the craftsman spirit alive in our hearts and minds. For us, a stack of lumber, discarded hardware and old bicycles are an inviting blank canvas. We don’t know what we’ll make next, but we’re looking forward to it!